If you’re a mom-to-be, you have only a few months left in which you will be able to go on vacation together only with your hubby. So, take advantage of this period and travel where your heart desires. Being pregnant doesn’t have to mean you cannot travel anymore, at least until your third trimester. Your life is about to change forever and, even if there will be stressful moments, in the end, all will be worth it, when you hold your infant close to your chest. Until then, take the opportunity to relax and enjoy some quality time with your partner. Today, I wanted to share with you some of the best babymoon ideas. Try to choose a hotel or accommodation that’s close to the main attraction. Let’s hope you can find one that’s nice without breaking the bank. If your budget allows it, you can even treat yourself with a room with a Jacuzzi tub. However, make sure the water and the bubbles won’t affect your pregnancy. Staying healthy, both physically and emotionally, especially when a baby is on the way is more than important. So, all the sightseeing and those wonderful views will definitely help you feel energized, relaxed, and refreshed. No matter what you do, I would suggest you invest in a high-performance and comfy pair of sneakers because you will be walking a lot. Pack properly – you will get wet for sure, particularly if you want to experience an up-close encounter with the waterfall. The power of the water is incredible so, besides purchasing a plastic poncho, I would also recommend you to pack some extra footwear and socks. This is a great babymoon destination if you want to simply relax, enjoy sunbaths on white sandy beaches, sink your toes in a tropical ocean, indulge in decadent food at fancy restaurants, and many other pleasant activities. The Bahamas features some of the most luxurious accommodations on the planet. Many of them have their own private beaches, so you will have plenty of privacy and quiet time. Be prepared to do a lot of walking because Bahamas resorts are huge, although many of them provide transportation in the form of shuttle buses. So, pack accordingly and don’t forget to take a couple of comfortable sports shoes in the luggage. What better place to recharge your batteries and relax than a natural setting?! Some pregnant women feel the need to reconnect with Mother Nature. 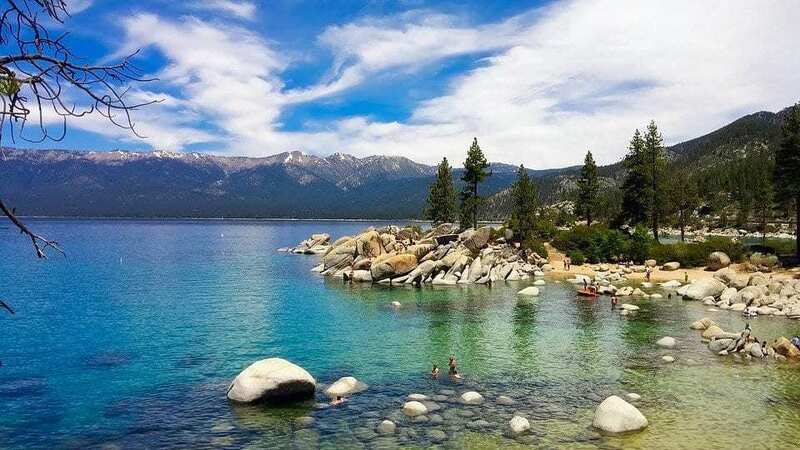 At Lake Tahoe, you will find scenic landscapes and fresh mountain air. Moreover, there are accommodations that offer both convenience and comfort. Try to find a place where you can do a lot of interesting and relaxing things without really going too far from the hotel grounds. I don’t know about you, but when it comes to mountains and nature, I would always choose a little cozy location where you can sit around a warm campfire or enjoy the taste of marshmallows. Be aware of forest fires. In the summer, there are higher risks of wildfires which can seriously mess up the quality of the air, not to mention all the other potentially harmful effects. Research these aspects online or ask the people involved before going on the trip. There are so many reasons to why you should consider Rincon as an excellent babymoon destination. First of all, there are plenty of hotels situated right on the beach, so the relaxation mode will be turned on almost instantly. Gorgeous pools sparkle in the sunlight all over the place and the resorts provide anything you can imagine. It’s a place where you will create a lot of beautiful memories together with your husband or family. The beaches and the water are excellent for future moms due to warm weather, lazy non-threating waves, and shallow pools. If you decide to go to Puerto Rico, you should definitely see Gozalandia waterfalls. There are literally dozens of attractions you can visit such as caves, lighthouses, waterfalls, museums, lakes, rivers, tiny islands, tropical farms, etc. In Atlantic City, you can have an awesome babymoon. Furthermore, if you decide to plan this trip off-season, you will get great rate deals. Also, during the off-season, the entire place is less crowded and both hotel lobbies and casinos are basically smoke-free. From valet parking to shuttle buses and room service, there’s nothing you can’t benefit from here. In fact, Atlantic City offers a mix of everything you may need. For instance, you’ll be pleased to know that some hotels have expedited check-in for pregnant women. Here, you can relax outdoors, by the pool, eat delicious foods, gamble a little bit, and many other attractive recreations. You might like to soak up in a rooftop pool but not all of them are open throughout the year. As a matter of fact, most of them are seasonal. Charleston is a very nice babymoon destination, regardless of how long you plan to stay. It’s great for long vacations and short weekend getaways alike. In other words, this is an excellent location full of fun activities, restaurants, and entertaining attractions but the best part is that you can soak up the history, dine at fancy and classy restaurants, and shop till you drop. I would love to stay at a historic hotel there that’s situated in an old building with breathtaking architecture. Then, there’s the harbor where you can take long relaxing walks, the city market, and a lot of charming cobblestone streets. You can take the guided tours at first if you want, but then, go ahead and discover the attractions on your own. Grab a man and start wandering around. From New York to the Azores, it’s a 6-hour flight but you will feel like this gorgeous place is located far far away. Book the trip online, through a travel agency because this will allow you to choose and personalize your babymoon just the way you want in order to suit your lifestyle. There are several luxury hotels situated right next to the beach where you will be able to gaze at the ocean for hours at a time. You’re on vacation which means you’re supposed to have fun but also relax and unwind. This calls for a whole day at the spa so choose that touristic package, if you want. You’ll be glad to know that the Azores isn’t a party destination. So, if your ideal vacation is in a tranquil location, this is a suitable place. Regardless of your due date, I am sure that there’s a perfect getaway in the list above that matches your budget, preferences, and lifestyle. Traveling to a babymoon destination is a great way to celebrate the birth of your child. Still, you should always check with your OBGYN to see if he or she approves the trip. Tell us about your dream babymoon in the comments section, below!